LAWRENCEVILLE, Ga. (February 4, 2016) – Lust over laughable comedy nights, pulse to the passionate rhythm of Latin music and celebrate a true valentine to youth, life, love and the beauty of human connection in the smash-hit I and You! While Cupid draws his arrow and sweethearts prepare for the perfect date night, don’t forget to add Aurora to the love list for head over heel events guaranteed to create heartwarming memories! February 13 at 7 p.m. This Valentine’s Day is going to get physical! 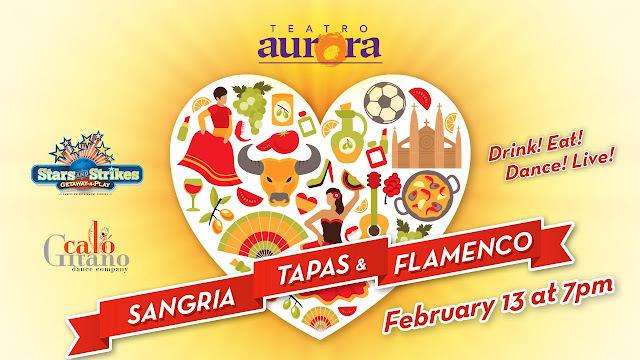 Pulse to the passionate rhythms of Caló Gitano Dance Company as Teatro Aurora presents Sangria, Tapas y Flamenco on Saturday, Feb. 13 at 7 p.m. A perfect evening of food, fun and romance with a side of Latin flair, guests will have access to a full bar and other menu items available. Held at Stars and Strikes’ private event hall, the evening is sure to be muy caliente! Tickets are $30 for individuals, $50 for couples and $150 for a table for up to 10 guests. An optional add-on for two tapas and choice of sangria or cerveza is available for $10. Through February 21; 2:30 p.m. and 8 p.m.
A quintessential tale of two worlds colliding, audiences are invited to experience the power of diversity and the beauty of acceptance in the award-winning I and You at Aurora Theatre, now through February 21. As part of the 2015-16 GGC Harvel Lab Series, this moving story of two teenagers and the bond they create through examination of poetry offers an ode to youth, life, love and the strange splendor of human connectedness! On Thursday, February 11, Aurora will host a FREE Community Conversation: “Misfitting In,” starting at 7:15 p.m. Addressing the social situations and anxieties that can make acceptance difficult, as well as ways to empower both parents and teenagers to tackle and overcome these obstacles with positive tactics, “Misfitting In” is a perfect topic for all ages. Regular show tickets are general admission and start at $20. Friday and Saturday, Feb. 12 and 13 at 8 p.m.
Friday and Saturday, Feb. 26 and 27; 7:15 p.m. and 9:15 p.m.
Aurora Comedy Nights returns this month with a plethora of funny for the whole family! Valentine’s weekend isn’t complete without local sweethearts Dad’s Garage, tearing up the Mainstage with laughter aplenty. With tickets only $10, this is a can’t-miss performance! Rounding out the last weekend of the month is headliner Erin Jackson with featured comedian Mag Jackson! Since first making a name for herself at colleges and east coast comedy clubs, Erin’s conversational style and relatable humor have helped to propel her onto the national stage. While Mag is a rising star from the small town of Fort Myers, Fla., which is widely known for producing professional athletes, he’s taking his talents down a different avenue: the art of laughing! This comical duo is bringing in the humor hot for February! Tickets are $18. For more information on Aurora Theatre programming or to purchase tickets for events, visit www.auroratheatre.com or call the Box Office at678.226.6222.